Ottawa resident and PhD holder in optics and photonics Dan Yang decided to leave her career in networking technology to invent a toddler-friendly tablet because she was concerned for her own baby’s safety. It’s not that Yang’s daughter, who is now 30-months-old, was in immediate or serious danger – but the Yang’s protective maternal instincts were piqued when she observed her daughter Herac’s interest in technology. She was worried about her daughter not only suffering bumps and bruises from handling modern tech, but also about whether it was providing sufficient mental nourishment for a rapidly developing mind. 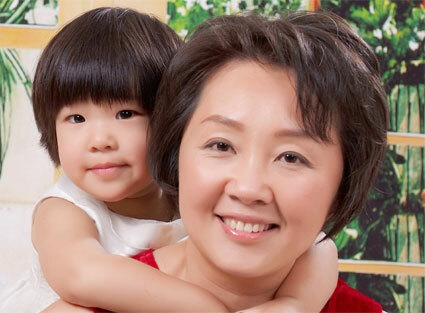 Dr. Dan Yang and her daughter, Hera. That attempt to “do better” led Yang to found Rullingnet Corp., a company based in Santa Monica, Calif. that does most of its development work in an Ottawa-based office. Its product, the Vinci tablet, offers a unique category of early learning systems specifically designed for children four years and under. It offers an Android-based touch screen tablet with specs up to a competitive standard, but protected by a soft rubber bumper that surrounds the device, protecting both the toddler from injury and the device from damage. Rullingnet encourages parents to sit down and play its educational games and digital story books with their child, making it a participatory learning experience rather than a technological babysitter used merely to keep the child busy. New parents in this connected era are often amazed by how quickly their young toddlers take to technology, comfortably manipulating touch screens and focusing intently on visuals appearing on digital displays. Now startup firms are looking to capitalize on that trend, designing technology tools to help parents and requiring the active participation of children. Still, some parents may be apprehensive about engaging their young children with technology in a society that is over-saturated with it. The same parenting techniques can be done without assistive technology, says Joan Grusec, a professor of psychology at the University of Toronto. If children are too immersed in a digital world, they may lose out on skills for the real world. Parents using Montreal-based Ncentiv Inc.’s HighScoreHouse.com don’t seem to be too worried about technology overload, according to co-founder Kyle Seaman. His main metric for the new site’s success is counting the number of exclamation points he receives in his e-mails. Launched this summer with a graphically-appealing Flash-based interface, HighScoreHouse.com allows parents to manage their kids’ chores using gold stars as a currency to reward them. Parents login to setup the chores, which are divvied up by time of day, and assign a gold star value to them – maybe taking out the garbage is worth five stars. Then children login to see the chores they’ve been assigned and tick off the jobs they’ve completed to claim the stars. Children can see rewards that are made available by their parents and valued at a certain number of gold stars – perhaps exchanging 25 stars for a later bed time, or 100 stars for a new toy. The site’s user interface has many animations but keeps a clean interface. Seaman and HighScoreHouse.com’s other co-founder are both in their 20s and childless. It was only 10 years ago that Seaman was earning gold stars of his own, tracked on the fridge. That’s why the team spent months doing field research, talking to parents and working with a psychologist to develop their system. But not all parents may want to train their children to expect a reward for pitching in around the house, psychology professor Grusec says. HighScoreHouse.com is about external motivation, rather than intrinsic motivation, she adds. Studies show that children who did work around the house without being asked to were more positive and helpful to others in some areas of their lives. For the co-founders of the site, they’re currently seeking external motivation in the form of fundraising right now, hoping to build enough of a nest egg to run the business for 12 months with six employees. They are also continuing development of the site, hoping to see between 50 and 100 families a day sign up for the service. An iPhone app is also in the works. HighScoreHouse.com and Rullingnet aren’t the only companies looking to add technology to the parenting process. Childzilla.com is another Web site in beta that offers configurable online chore charts with customizable rewards. Rullingnet’s Vinci tablet is competing head-on with a more mature market in tech for developmental education, including competitor LeapFrog Enterprises Inc., which sees its tablet and handheld systems lining the shelves at retailer Toys “R” Us. A young toddler engages with the Vinci tablet. But Yang is confident parents will see the value of her company’s tablet. Vinci encourages parents to play with their children and later versions may see guiding cues for parents build into the software, Yang says. There will also soon be a diary released allowing parents to track developmental milestones their child should be hitting at a certain age. Yang sits with her own daughter as she plays on the Vinci tablet, and prompts her to think about what’s on the screen at a deeper level. “The parents can help their children by asking questions,” she says. She can also let her toddler play with the tablet and maintain peace of mind, knowing the rubber bumper will prevent broken teeth or bruised toes.